So if that’s what you’re looking for, then you’ve come to the right place. It’s important to remember that as a Respiratory Therapist, ventilation and gas exchange are the most important things for us to keep in mind. And in order to maintain it properly, the patient must have a patent airway. This is why this section is very important for Respiratory Therapy students. It’s critical that you know have to manage the patient’s airway properly, not only for your classes and for the board exams but also for in real-life situation when you start seeing patients on your own. Also keep in mind, this information correlates well with Egan’s Chapter 36 as well. So are you ready to dive in? And by the way, if you need help with your Egan’s Workbook, we looked up the answers for you so that you don’t have to. Check out our Workbook Helper to learn more. 1. When is an artificial airway required? When the patient’s natural airway can no longer perform its proper functions. 2. What are the contraindications of an artificial airway? When the patient desires to be a DNR or Do Not Resuscitate. 3. What are the possible complications of an artificial airway? Trauma to the nose, mouth, tongue, pharynx, larynx, vocal cords, trachea, esophagus, spine, eyes and teeth. Aspiration or infection. 4. What does a pharyngeal airway do? It prevents airway obstruction by keeping the tongue pulled forward and away from the posterior pharynx. 5. Do nasal pharyngeal airways always enter the trachea? 6. Which artificial airway is best for suctioning? 7. What artificial airway can be used as a bite block? 8. Which artificial airway is mainly used in emergency life support? 9. What is an Endotracheal tube? An artificial airway that is placed in the trachea in order to support mechanical ventilation. The process of placing an artificial airway into the trachea. 11. Do pharyngeal airways extend only into the pharynx? 12. What is orotracheal intubation? When the tube passes through the mouth into the trachea, as opposed to being passed through the nose. 13. What is nasotracheal intubation? When the ET tube passes through the nose into the trachea, as opposed to being passed through the mouth. 14. What are two types of tracheal airways? Endotracheal tubes and Tracheostomy tubes. 15. Are tracheostomy tubes inserted surgically? 16. What is the purpose of the angle of the bevel on the ET tube? It minimizes mucosal trauma during insertion. 17. What is the purpose of inflating the cuff of the ET tube? It protects from aspiration and helps provide positive pressure ventilation. 18. What are the three areas of skill for Respiratory Therapists in airway management? (1) Insert and maintain artificial airways. (2) Be proficient in airway clearance. (3) Assist physicians in performing procedures related to airway management. 19. What are the two categories of airways? 20. What are the two types of pharyngeal airways? 21. What are Oropharyngeal airways made of? 22. What are the indications of an oropharyngeal airway? (1) Prevent airway obstruction by the tongue, (2) To be used as a bite block, (3) To increase the effectiveness of bag/mask ventilation. 23. What is a contraindication of an oropharyngeal airway? A conscious patient with a gag reflex. 24. What are some complications of the oropharyngeal airway? Laryngospasm/cough, vomiting/aspiration (do not tape in place), airway obstruction, lip or tongue damage, dental damage. 25. How is the oropharyngeal airway sized? 26. What are the most common oropharyngeal airway sizes for the adult airway? 27. The nasopharyngeal airway (NPA) is also known as the? 28. The nasopharyngeal airway is inserted where? 29. What are the indications of the nasopharyngeal airway? (1) increase effectiveness of bag/mask ventilation, (2) aid with suctioning and bronchoscopy, (3) management of facial anomalies, (4) eliminates the risk of oral damage. 30. What are the complications of using a nasopharyngeal airway? 31. The nasopharyngeal airway is tolerated best by a? 32. What are the steps for placing a nasopharyngeal airway? (1) Head tilt, (2) H2O soluble lube, (3) Slowly advance the airway, (4) It should rest above the epiglottis, (5) You can observe the correct placement with a tongue depressor. 33. What are some indications of tracheal intubation? (1) To bypass an upper airway obstruction. (2) To protect the airway from aspiration. (3) To apply positive pressure ventilation. (4) To aid clearance of secretions. (5) To deliver high oxygen concentrations. 34. Can you instill drugs down an ET tube? 35. What drugs can be instilled down the ET tube? 36. What are the advantages of oral intubation? (1) Faster, easier, less traumatic, more comfortable. (2) Larger tubes can be tolerated. (3) Easier suctioning. (4) Less airflow resistance. (5) Decreased work of breathing. (6) Decreased risk of the tube kinking. (7) Avoids nasal and paranasal complications. 37. What are the disadvantages of oral intubation? Greater risk of self-extubation, Greater risk of mainstem intubation, Risk of tube occlusion from biting, Risk of injury to the oral structures, Greater risk of retching, vomiting, and aspiration. 38. What is the preferred method of intubation during CPR? 39. How is the ET Tube size measured? It’s measured in millimeters on the inside diameter. 40. What do the centimeter markings on the ET tube indicate? They indicate the placement of the tube. 41. What is the purpose of using a stylet during intubation? It gives the tube more rigidity. 42. What are the advantages of nasal intubation? Greater comfort, less salivation, improved swallowing, more communication, no need for oral care, helps to avoid occlusion from biting, less damage to oral structures, better stabilization, reduced risk of mainstem intubation, does not require muscle relaxants or sedatives. 43. What are the disadvantages of nasal intubation? Nasal/paranasal complications, It is more difficult to perform, Spontaneous breathing is required for the procedure, A smaller tube is necessary, Increased difficulty suctioning, Increased airflow resistance, Increased work of breathing, Difficulty passing the bronchoscope. 44. What is the name of the curved laryngoscope blade? 45. Would you want to use the Macintosh blade for neonates? 46. Where is the Macintosh blade designed to fit? 47. What is the name of the straight laryngoscope blade? 48. Where is the Miller blade designed to fit? 49. Which laryngoscope blade is best for neonates? 50. What is the purpose of the Murphey’s eye? It allows for collateral ventilation. 51. What are the supplies needed for oral intubation? Oxygen flowmeter and tubing, manual resuscitator, suction setup, oropharyngeal airway, laryngoscope, endotracheal tubes, stylet, stethoscope, tape, 10 cc syringe, towels for positioning, gloves, gowns, masks, eyewear, CO2 detector. 52. Where should the tip of the endotracheal tube rest? It should rest 2 – 4 cm above the carina. 53. What should the tube depth of the ET tube be for the adults? 54. How long should you hyperinflate and hyperoxygenate the patient for the oral intubation procedure? 55. What is an extra piece of equipment you may need for nasal intubation? Magill forceps for direct visualization only. 56. What position should the patient be in for nasal intubation? 57. How do you confirm placement of the airway? Auscultation, observation of chest movement, PetCO2, Esophageal detection device, light wand, fiberoptic laryngoscopy, CO2 detector. 58. What is the most accurate way to confirm placement after intubation? 59. Should you use a chest x-ray to confirm tube placement after an intubation? No, it should only be used to determine the position of the tube. 60. When should you consider a tracheostomy? When the ET tube will be inserted for longer than 7 days. 61. What are the indications of a tracheotomy? 62. What are the advantages of the tracheotomy? More comfortable, less tube movement, better communication, lower airway resistance, easier suctioning, easier to replace than an ET tube. 63. What are the disadvantages of the tracheotomy? Requires a surgical procedure, hemorrhage, possible subcutaneous emphysema, possible pneumothorax, possible pneumomediastinum, leaves a permanent scar. 64. When is an uncuffed tracheostomy tube used? When there is no major concern about aspiration or being able to protect the airway. 65. What is the fenestrated tracheostomy tube? It can help facilitate speech, it can be cuffed or uncuffed, the inner cannula must also be fenestrated. 66. What are the complications of intubation post-extubation? Sore throat, stridor, odynophagia, pulmonary aspiration, poor cough. 67. What is the number one complication post-extubation? 68. How do you prevent airway trauma? Use sedation when necessary. Use nasal tubes vs. oral tubes when possible. Use correct sizing tubes. Avoid changing tubes. Avoid unnecessary coughing or efforts to talk. Limit cuff pressure. 69. What is the process of airway maintenance? (1) Securing the tube and maintain proper placement. (2) Provide cuff care. (3) Aid secretion clearance. (4) Ensure humidification. (5) Minimize the possibility of infection. (6) Provide for patient communication. (7) Troubleshoot emergencies. 70. What do you need in order to secure the ET tube? Tape, Velcro attachments, harness, bite block. 71. What do you need in order to secure the tracheostomy? 72. You should always record what values for positioning on the ET tube? 73. Unplanned extubations occur in what percentage of intubated patients? It occurs in 2 – 13% of patients. The #1 contributing factor is a lack of secure placement. 74. What is the ideal method for securing an ET tube? It allows minimal tube movement, is comfortable for the patient, allows for oral hygiene, preserves skin integrity, easy to apply, requires minimal maintenance. 75. When maintaining cuff pressure, it is important to? Keep the cuff pressure below tracheal capillary perfusion pressure. 76. What is the normal cuff pressure range? 77. How can you measure cuff pressure? If you have not got a pressure manometer you can use the minimal leak technique or minimal occluding volume technique to inflate the cuff. 78. What are some emergency airway situations? Tube obstruction, cuff leak, accidental extubation. 79. What are examples of a tube obstruction? Kinking or biting, herniation of the cuff over the tube, jamming the of tube opening against the tracheal wall, mucus plugging. 80. What are clinical signs of an airway emergency? Various degrees of respiratory distress. Changes in breath sounds. Air movement through the mouth. 81. How do you fix kinking of the ET Tube? 82. How do you fix biting of the ET Tube? 83. What should you do in the case of a herniated cuff? Deflate/re-inflate, then try to pass a suction catheter to determine if cuff is herniated. 84. What should you do in the case of the tip of the tube is on the tracheal wall? 85. What should you do if there is a mucus plug? Lavage, try to pass a suction catheter, then resort to extubation. 86. What should you always do prior to extubation? The removal of the endotracheal tube. 88. What are some indications for extubation? The patient can: Keep their upper airway patent. Protect their lower airway from aspiration. Clear secretions from their lower respiratory tract. Breathe without mechanical ventilation. 89. What are the percentages of extubation failures? 5-15% of cases are failures. 90. A practitioner who extubates should also be able to do which of the following? 91. What can be used to maintain a trach stoma? 92. How is the Laryngeal mask airway (LMA) inserted? 93. How is the Esophageal obturator (EOA) inserted? It is inserted into the esophagus and mainly is used by EMTs. It is difficult to obtain proper mask fit and ventilation. You should always intubate prior to removal of an EOA. 94. How does the ET tube exchanger work? It is inserted through the ET tube. Then the ET tube is withdrawn and removed. A new ET tube can be slipped over the tube exchanger and threaded down into the proper location. 95. What are the supplies needed for tracheostomy care? Suction supplies, oxygen therapy, hydrogen peroxide, sterile dressings and ties, sterile water, new inner cannula or supplies to clean the reusable one. 96. What can you give to reduce inflammation post-extubation? 97. What should the patient’s FiO2 be in order to process with extubation? 98. What are the 6 aspects of airway maintenance? (1) Natural airway. (2) Artificial Airways. (3) General consideration of airways. (4) Nasal and oral (pharyngeal airways). (5) Tracheostomy. (6) Airway clearance. 99. What are the causes/types of obstructions in a natural airway? (1) soft/tissues (tongue) obstruction. (2) Foreign body. (3) Supra-glottic, sub-glottic swelling/edema. (4) Very thick secretions. (often described as inspissated). 100. What are the signs of a complete obstruction in a natural airway? (1) Paradoxical chest movement. (2) Inability to vocalize and no air movement sound at all. (3) Marked use of accessory muscles. (4) Marked nasal flaring, retractions etc. (5) Severe/marked anxiety, agitation. 101. How do you establish patency in a natural airway? (1) Modified Jaw thrust. (2) Head-tilt/chin-lift. 102. What is the modified jaw thrust? It is modified to avoid head-extension and is good for suspected neck trauma patients. It is done by pushing the mandibular process to extend the jaw and open the airway. 103. How do you perform the head-tilt/chin-lift maneuver? It is done by lifting up on the front edge of the jaw with one hand while pushing the forehead upward. You should not use this when there is a suspecting neck fracture (no hyperextension of the head). 104. What is the procedure for an extubation? (1) Clear the airway by suctioning below and above the airway. (2) Explain the procedure to the patient. (3) Remove the air from the cuff. (4) Have the patient inhale and hold. Remove the tube while the patient is holding maximum inspiration. (5) Instruct the patient to cough and expectorate. You can facilitate with a suction device if needed. 105. What is the purpose of suctioning while an artificial airway is in place? To remove secretions, promote expectoration of secretions (cough), or to collect a specimen. 106. What is the suctioning procedure while an artificial airway is in place? Pre-oxygenate the patient with 100% oxygen before and after suctioning for 1 – 3 minutes. The procedure should be sterile. Suction no longer than 15 seconds. Stop suctioning if any signs of distress become present. 107. What are hazards of suctioning during an artificial airway? Bleeding/trauma to the mucosa, so be gentle and use lubricant. Cardiac changes can occur due to vagal reflex (bradycardia) and hypotension from vagal nerve stimulation. Tachycardia due to hypoxemia. Use sterile technique. 108. How do we determine the size of an oropharyngeal airway? The length should be equal to the distance from the angle of the jaw to the tip of chin to past corner of the mouth. 109. How do we determine the size of a nasopharyngeal airway? The outside diameter of airway should be equal to the inside diameter of the patient’s external nares. The length of the airway is from tip of the earlobe to center of nostrils. 110. How do you insert a nasopharyngeal airway? It should be inserted opposite of its anatomic shape (upside down) to the back of the throat and then rotate into its correct position. 110. How do you insert an oropharyngeal airway? It should be inserted the way it’s anatomically shaped using a water-soluble lubricant. 111. What is the Minimal Occluding Volume (MOV)? A technique used to inflate the cuff to 20 – 25 mmHg/25 – 30 cmH20. Listen for an air leak as the cuff is inflated during positive pressure ventilation. Stop inflating at the minimum volume necessary to eliminate air leak via tracheostomy or ET Tube. 112. What is the Minimal Leak Technique (MLT)? Slowly inject air into the cuff during positive pressure inspiration until the leak stops. A small amount of air is removed to allow a slight leak during peak inspiration. Remove the small amount to prevent aspiration. 113. How do you troubleshoot a laryngoscope? If the light doesn’t work, tighten bulb, check the handle attachment, change the blade, or change the batteries. 114. What are the normal blade sizes? Adult: Size 3, Pediatric Size: 2, Term Infant: Size 1, Pre-Term: Size 0. It is used to aid in oral intubations only. It shapes the tube for easier insertion. The end is to be recessed 1 cm above ET tube. They are used to aid in a nasal intubation. They are inserted in the mouth to lift the tube into the trachea. 117. What are the normal ET tube markings? For an oral Intubation: 21 – 25 cm mark at the lip. For a nasal Intubation: 26 – 29 cm mark at the nares. 118. What is the Double Lumen Tube (Carlen’s Tube)? An ET tube with two independent lumens of different lengths. The longer tube is inserted in either the left or right mainstem bronchus. The shorter tube is placed in the trachea above the carina. Each Lumen can ventilate one lung separately or they can be connected via wye and share the ventilation source. 119. What is a Laryngeal Mask Airway (LMA)? It is positioned directly over the opening into the trachea (hypopharynx). You can even intubate through the LMA. Do not remove the LMA until the patient is intubated. 120. Identify three methods to determine the correct position of an ET tube? (1) Inspection – look for bilateral chest expansion during inspiration. (2) Auscultation of the patient’s breath sounds. They should be heard on both sides of the chest. (3) Chest X-ray – the radiopaque line on the endotracheal tube can be easily visualized to assess tube placement. 121. How can a respiratory therapist maintain airway patency? 122. Name two types of Laryngoscope blades commonly used to intubate adult patients and describe how each is used? For the laryngoscope handle, always hold in left hand, check the battery for light source. For a curved/Macintosh blade, it fits into vallecula and indirectly raises the epiglottis. For the straight/Miller blade, it fits directly under the epiglottis and is the preferred blade for infant intubations. 123. What steps should the respiratory therapist take if the light on the Laryngoscope blade does not work? Tighten the bulb, Check the handle attachment, Change the blades, Check the Batteries. 124. What size laryngoscope blade commonly used for an adult patient? 125. What size laryngoscope blade is commonly used for a term infant? 126. What is the approximate endotracheal tube sizes for a pre-term infant? 127. What is the approximate endotracheal tube sizes for a full-term infant? 128. What is the appropriate endotracheal tube sizes for adult males and females? Males: 8.0 to 9.0mm; Females: 7.0 to 8.0 mm. 129. A patient receiving mechanical ventilation is being transported to radiology for a CT scan. The respiratory therapist is arranging equipment when the low volume alarm begins to sound. She also notes that the oral endotracheal tube is taped at the 28 cm mark. Where should the tube actually be located? 130. Why should the ET tube be removed at peak inspiration? 131. What should you do if the patient self-extubates? Alert the physician. Re-intubate the patient. 132. Identify a possible complication of extubation and how to manage it? For mild distress/stridor and a sore throat, you should provide humidity, oxygen and/or racemic epinephrine as necessary. 133. Tracheostomy is preferred over endotracheal tube intubation in what instance? It is the preferred method of providing an airway for patients who require long-term ventilation. 134. List two possible immediate complications of the tracheostomy procedure? Bleeding is a major hazard, and you also have to watch for a Pneumothorax. 135. List two possible late complications of the tracheostomy procedure? 136. Under what circumstances should the tracheostomy tube cuff be inflated? If should be inflated if the patient is eating, or if they are on positive pressure ventilation. 137. What does it mean if the therapist recommends a fenestrated tracheostomy tube? It is used for weaning and temporary mechanical ventilation with an inner cannula. 138. Briefly, describe the features of a standard tracheostomy tube? It’s often white and made of plastic. It may have an inner cannula for easy cleaning. Also, it has a soft cuff. 139. When using a tracheal speaking valve, the tracheostomy tube cuff must be? The cuff must be deflated. 141. A nasopharyngeal airway is also commonly called a? 142. What does LMA stand for? 142. Oropharyngeal airways are indicated for ______________ patients. 143. Can incorrect placement of an oropharyngeal airway (OPA) push the tongue further back into the pharynx worsening the obstruction? Why yes, yes it can. 145. The most common airway maneuver used to ventilate an apneic patient during CPR is which of the following? 146. What is the proper way to estimate the appropriate length of a nasal airway? 147. When is the jaw thrust technique indicated to help maintain an open airway? 148. Should a laryngeal mask airway be used for short-term ventilation of an unconscious patient? 150. Which of the following is a hazard of the insertion of an oropharyngeal airway? 151. What is the position of a correctly sized properly inserted oropharyngeal airway? The distal tip should be at the base of tongue, the flange should be outside the teeth. 152. What is a tracheotomy? It’s an incision into the trachea and the procedure for establishing access to the trachea. 153. What is a stoma? It’s a hole in the trachea without the tube in place. 154. What are some complications of a tracheostomy? Bleeding, pneumothorax, air embolism, and subcutaneous emphysema. Some late complications: infection, hemorrhage, tracheal stenosis. 155. What is a Passy-Muir speaking valve? It’s a one-way valve that attaches to the 15 mm adaptor and allows for speech and secretion management. It allows air to enter only during inspiration. The blue-colored ones are used with ventilators. The white ones are for spontaneously breathing patients. 156. What is the tracheostomy button used for? It’s used to aid in weaning from the trach tube. It keeps the stoma open. It extends from the skin to just inside of the tracheal wall. 157. What does the tracheostomy button look like? It’s a short, soft hollow tube which fits in stoma in place of the tracheostomy tube. 158. When will you need to do a tracheostomy change out? When the patient needs a new one, when the patient’s condition is unstable, when there is edema around the site that may make change difficult. 159. What are the methods for weaning from tracheostomy tube? Tracheostomy buttons, fenestrated tubes, progressively smaller tracheostomy tubes. 160. What is the laryngeal mask airway? A hollow tube with a spoon-shaped mask. The mask has a cuff attached to the end of it, which inflates to permit the area around the tracheal glottis and epiglottis to be sealed. It sits on the esophageal sphincter. 161. What is the biggest problem with an LMA? 162. What is one the most common causes of airway obstruction? 163. How do you know there is an obstruction in the tube? When the peak airway pressure on the ventilator increases. 164. When will you need to remove the entire airway and replace it? If all the other methods are not working. 165. Which airway is preferred during an emergency? 166. Why would a tracheostomy be preferred? 167. What are some complications for a tracheostomy? Infection, pneumothorax, bleeding, granuloma, hemorrhage. 168. What should you do when weaning a tracheostomy patient? Remove the inner cannula, deflate the cuff, and cap the tracheostomy. 169. Which of the following types of artificial airways are inserted through the larynx? Nasotracheal tubes and orotracheal tubes. 173. What is the standard size for endotracheal or tracheostomy tube adapters? 174. What is the purpose of the additional side port (murphy eye) on most modern endotracheal tubes? To ensure gas flow if the main port is blocked, in addition to the beveled opening at the tip, there should be an additional side port or murphy eye which ensures gas flow if the main port should become obstructed. The tube cuff is permanently bonded to the tube body. 175. What is the purpose of a cuff on an artificial tracheal airway? To seal off and protect the lower airway. 176. What is the purpose of the pilot balloon on an endotracheal or tracheostomy tube? To monitor cuff status and pressure. 177. Which of the following feature incorporated into most modern endotracheal tube assist in verifying proper tube placement? Length markings on the curved body of the tube, imbedded radiopaque indicator, and near the tube tip. Aid in routine cleaning and tracheostomy care, provide a patent airway should it become obstructed. Laryngoscope light source, endotracheal tube cuff, suction equipment. 180. Which of the following statements are false about methods used to displace the epiglottis during oral intubation? Levering the laryngoscope against the teeth can aid displacement. 181. A surgical resident has asked that you assist in an elective tracheotomy procedure on an orally intubated patient. which of the following would be appropriate action? Withdraw the oral tube 2-3 inches while the incision is made. 182. What is the most common sign associated with the transient glottic edema or vocal cord inflammation that follows extubation? 183. Soon after endotracheal tube extubation, an adult patient exhibits a high pitched inspiratory noise, heard without a stethoscope. Which of the following actions would you recommend? 184. After removal of an oral endotracheal tube, a patient exhibits hoarseness and strider that do not resolve with racemic epinephrine treatments. What is most likely the problem? 185. Which of the following injuries are NOT seen with tracheostomy tubes? Glottic edema and vocal cord granulomas. 186. Tracheal stenosis occurs in as many as 1 in 10 patients after prolonged tracheostomy. At what sites does this stenosis usually occur? The cuff site, tip of the tube, and the stoma site. 187. A patient is being evaluated for tracheal damage sustained while having undergone prolonged tracheostomy intubation approximately 3 months earlier. The flow-volume loop demonstrates a fixed obstructive pattern. What is most likely the cause of the problem? 188. A patient has been receiving positive pressure ventilation through a tracheostomy tube for 4 days. In the past 2 days, there is evidence of both recurrent aspiration and abdominal distention but minimal air leakage around the tube cuff. What is most likely cause of the problem? 189. A physician is concerned about the potential for tracheal damage due to tube movement in a patient who recently underwent tracheostomy and is now receiving 40% oxygen through a T- tube (Briggs adapter). Which of the following would be the best way to limit the tube movement in this patient? Switch from the T-tube to a tracheostomy collar. 190. Which of the following techniques or procedures should be used to help minimize infection of a tracheostomy stoma? Regular aseptic stoma cleaning, adherence to sterile techniques, and regular change of tracheostomy dressings. 191. When checking for proper placement of an endotracheal tube or tracheostomy tube on a chest radiograph, how far above the carina should the distal tip of the tube be positioned? 192. When checking for proper placement of an endotracheal tube in an adult patient on chest radiograph, it is noted that the distal tip of the tube is 2 cm above the carina. Which of the following actions would you recommend? Withdraw the tube by 2 to 3 cm. 193. An alert patient with a long-term need for tracheostomy tube is having difficulty communicating with the intensive care unit staff. Which of the following would you recommend to help this patient communicate better? Use a letter, phrase, or picture board and consider a “talking” tracheostomy tube. 194. To ensure adequate humidification for a patient with an artificial airway, inspired gas at the proximal airway should be 100% saturated with water vapor and at which of the following temperatures? 32 to 35 degrees C.
196. Which of the following is likely to increase the likelihood of damage to the tracheal mucosa? Using a low residual volume low compliance cuff. 197. What is the maximum recommended range for tracheal tube cuff pressures? 198. Repeated connecting and disconnecting of a cuff pressure manometer to the pilot tube of a cuffed tracheal airway will do which of the following? 199. What type of endotracheal tube should the respiratory therapist use when a unilateral lung disease occurs and independent lung ventilation is needed? A double lumen endotracheal tube. 200. What is a good mnemonic to use to remember what equipment is needed during an intubation? SOAPME. It stands for: suction equipment, oxygen, airway equipment, position the patient, monitors, and esophageal detectors. So there you have it! That wraps up our study guide for Airway Management. I hope these practice questions were helpful to you. No matter where you are in your journey to becoming a Respiratory Therapist, whether still in school or already preparing to the TMC Exam, if you learned this study guide, it will help you tremendously. And don’t forget, if you need help with your Egan’s Workbook, we looked up the answers for you so that you don’t have to. Check out our Workbook Helper to learn more. Thank you so much for reading and as always, breathe easy my friend. 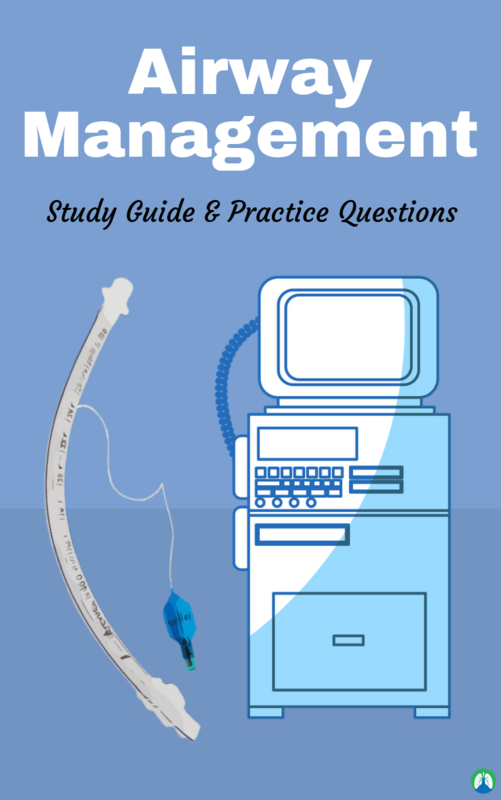 If you want an even more detailed review of Airway Management in Mechanical Ventilation, especially focused on what you MUST know for the TMC Exam, be sure to check out our fully comprehensive TMC Study Guide. It covers everything you need to know, from top to bottom, in order to pass the TMC Exam.